Wil Myers hit a tiebreaking double in the eighth inning for the Rays, but a 5-2 road trip left the Red Sox with an 89-59 record and a commanding 8 ½-game lead in the AL East. 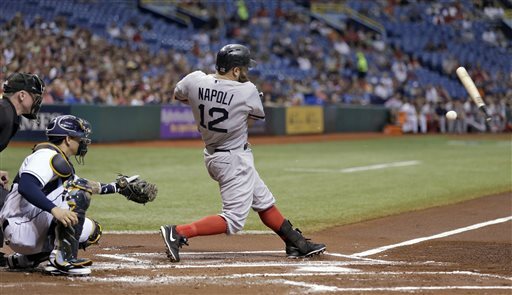 ST. PETERSBURG, Fla. (AP) — The Boston Red Sox couldn’t complete a sweep of the Tampa Bay Rays, but they finished another road trip better off than when they started. The Red Sox would need to win 11 of their final 14 games for a 100-victory season, but need just one win to reach 90 for the fifth time in seven years. Myers drove in Evan Longoria, who also doubled off Rubby De La Rosa (0-1), to give the Rays a 4-3 lead. Jake McGee (5-3) pitched a scoreless eighth before Fernando Rodney got three outs to earn his 34th save. The Rays lead the crowded race for the second AL wild card despite going 5-13 since Aug. 25. The Red Sox threatened in the ninth when Stephen Drew had an infield single and pinch-hitter Mike Carp walked with one out. Rodney worked out of the jam when pinch-hitter Will Middlebrooks lined out to third and Dustin Pedroia popped out. David Ortiz hit an opposite-field solo homer to left and Drew had a run-scoring double as the Red Sox tied it at 3 in the sixth. Ortiz has 43 career homers against Tampa Bay, the second-most by an opponent. Of those, 28 have come at Tropicana Field. Saltalamacchia snapped an 0-for-21 stretch and pulled Boston to 2-1 on a fourth-inning homer. Tampa Bay went up 3-1 in the bottom half when Desmomd Jennings hit a solo home run. Rays starter Jeremy Hellickson allowed three runs and four hits in 5 1-3 innings. Boston right-hander Jake Peavy appeared to get hit in the leg by Jennings’ drive in the sixth. The ball was redirected to third baseman Xander Bogaerts, who got a force at second. Peavy gave up three runs, four hits and five walks over six innings. Boston’s full bullpen was not available after Wednesday night’s 10-inning victory. NOTES: The Red Sox will honor New York Yankees closer Mariano Rivera before his last regular-season game at Fenway Park on Sunday. Rivera is retiring after the season. … Boston OF Jacoby Ellsbury (foot), who missed his sixth consecutive game and is not yet doing baseball activities, will have his status evaluated in the next few days. … Rays C Jose Molina left the team to be with his mother, who had surgery. He is expected back Friday. … Shane Victorino was out of the Red Sox lineup because Farrell wanted to give the outfielder a day off from playing on the artificial turf. … 2012 Olympic silver medalist and professional beach volleyball star Jen Kessy served a volleyball from the mound for the ceremonial first pitch.